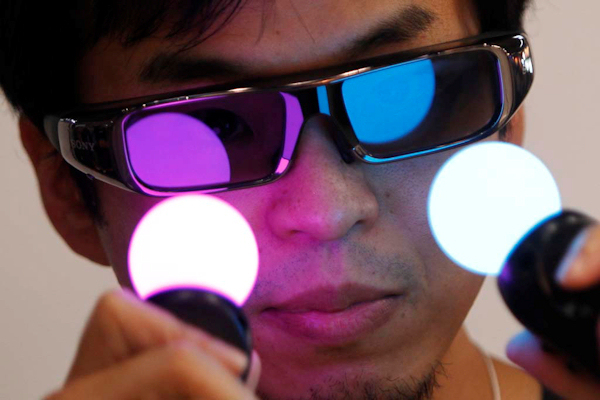 In Japan, it’s surreal reality meets virtual reality. TOKYO, Japan — High atop a 30-foot tower built to showcase Microsoft’s new Xbox360 Kinect, Japanese models kitted out in short-shorts, pigtails and sneakers scrambled to kick their virtual selves into high gear before a giant, cinema-sized screen. As they jumped and ducked, and their on-screen icons — the popular skateboarders from Sega’s new Sonic Free Riders game — raced and soared through the technicolor virtual landscape, it was hard to draw the line between the real and the surreal. And all around the colossal tower, a horde of headsetted gamers shuffled to the hypnotic screens of blockbuster “franchises” like Halo, Assassin’s Creed, Final Fantasy and Medal of Honor. While you weren’t paying attention, the global videogame industry has surpassed the movie business and the music business to become the highest-grossing entertainment industry in the world — bringing in about $20 billion a year. That’s right. The premier of a top title like Halo: Reach, the latest in a series of futuristic war games developed by a company called Bungie, is as big an event as the opening of a new flick from James Cameron or Steven Spielberg — both of whom have put their names behind top-flight game titles. Tripling the opening weekend gross of Inception, Halo: Reach alone did $200 million in business on the first day of sales, which coincided with TGS, held Sept. 16-19 in Tokyo’s Makuhari Messe. And gaming console technologies like Microsoft Kinect’s motion-sensitive game play (which makes Nintendo’s Wii look like Pong) and Nintendo’s glasses-free 3DS are actually pushing the cutting edge of computing. But what’s on display at TGS is not so much the technological advances in gaming — where the West has actually outstripped Japan in recent years, with biggies like Grand Theft Auto and Call of Duty coming out of Scotland and California. What’s on display here is the leading edge of virtual culture, where games go mainstream, and your average “salary man” blurs the lines between the everyday and the pixelated world. TGS, which started way back in 1996, plays host to the biggest names in the game business, including publishers, developers and console makers like Capcom, Electronic Arts , Sony and Microsoft. This year, more than 200,000 people attended the show, driving home the point that while Japan may be smaller in the gaming industry than it once was, the gaming industry is bigger than ever in Japan. With Japanese developers creating franchises like Final Fantasy, Metal Gear and Resident Evil, handheld gaming devices as ubiquitous as mobile phones, and an arcade on every Tokyo corner, the videogame industry accounts for an even larger share of the entertainment market here than it does on the down low in the West. Coming into this world as a non-gamer is a little like walking the red carpet at the Oscars without ever having seen a movie. Fully a third of the attendees — most of them apparently amateurs — were dressed in elaborate costumes, portraying characters from popular games, anime and manga series like Naruto , Full Metal Alchemist, or Gyakuten Saiban (“Ace Attorney”). And the outdoor hallways between the exhibition centers were quickly taken over for impromptu photo shoots as duplicate versions of silver-haired, emerald-eyed elves squared off to compare threads. The running patter of the models playing Sega’s Sonic Free Riders game, piped over monstrous speakers, was like the banter between the hosts of a bizarre variety show. The girls themselves were the flesh-and-blood versions of the pop-eyed pin-ups of the anime world. Outside the pavilion for Monster Hunter — the second-hottest selling game in Japan at the time — the surreal meets real aspect of the show hit me the hardest. A long line of fans waited patiently for their turn to be photographed with inflatable versions of characters from the game, and then grab a chance to play the new version for the handheld Playstation or Nintendo DS. And in the back of the booth, a doe-eyed human mannequin sat with her feet in a bubbling wooden hot tub — ersatz ancient Japan, I suppose — while a mad horde of photographers surged in to snap close-ups. The kewpie-doll-style model worked her lips and eyes like an automaton, in perfect imitation of some animated self. American game makers may have surpassed Japan’s. But when it comes to gamers, Tokyo is still streets ahead.